Dušan Barać was born in 1983 in Belgrade. He finished primary and secondary school in Sremska Mitrovica. He graduated from the Faculty of Organizational Sciences, University Of Belgrade, Information systems study program, in 2007. He enrolled to gain his doctoral degree in e-business at Faculty of Organizational Sciences, University Of Belgrade in 2007. 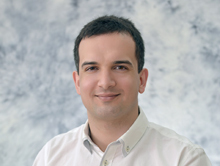 He defended his PhD thesis entitled “Development of models and services portal for adaptive e-learning” in 2011 on Faculty of Organizational Sciences, University Of Belgrade. He is employed at the Faculty of Organizational Sciences, University Of Belgrade in the position of associate teaching professor in the field of electronic business. He was appointed assistant professor in the field of E-business in 2012.During the evaluation of the students, his work was evaluated with highest marks. Prof. dr Dušan Barać has mentored one PhD thesis (Vanjica Ratković-Živanović). He supervises three ongoing doctoral theses. He was a mentor to numerous master and graduate papers. Prof. dr Dušan Barać has published eight papers in international journals in the SCI and SCIE list, five papers in journals of international and national importance that are not on the list of SCI list, about thirty papers in international and national conferences. He is a member of IEEE Computer Society. He was a member of the organizational board of Symorg 2016 conference. The “Introduction of GPS system in taxi service City Hall”, city of Belgrade, Department of Economics, 2007a. The “Distance education for the development and implementation of Internet Business Plan”, in the framework of allocation of funds for the promotion of employment in the city of Belgrade, City of Belgrade, Department of Economics, 2007a. The “application of computer technology in experimental solid state physics,” the developer: Faculty of Organizational Sciences, University Of Belgrade, Client: Ministry of Education, Science and Technological Development, City of Belgrade, 2011-2014. During undergraduate studies, he received several scholarships and awards as a student with a high average. Awarded by the Faculty of Organizational Sciences, University Of Belgrade as one of the top students in the class. During the first year of doctoral study he received a grant from the Ministry of Science for young scientists – PhD students.